The VersaPost costs less than other steel posts - Jeften LLC. 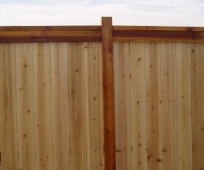 The affordable steel post for wood privacy fences. "The width of the hole should be as wide as feasibly possible; 12 inches is recommended. A 12-inch diameter post hole filled with concrete will withstand 17 percent more load than a 10-inch diameter hole and 33 percent more load than an 8-inch diameter hole." The VersaPost needs only a 6" diameter hole. Fence post holes also need to extend below the frost-line. The frost-line varies anywhere from 0" to 48" in North America. The VersaPost requires less concrete than a 4" x 4" wood post does. Less concrete means fewer 80 pound sacks to haul around and mix in a wheelbarrow. In addition to the concrete, when using wood posts most fence professionals recommend six inches of gravel below the concrete to allow for water drainage. The VersaPost does not require any gravel. Compare the total cost of a 4" x 4" post and the VersaPost. Every $1.00 increase in the cost of the post increases the cost of the fence by less than 13 cents per foot. And, the fence post is the key to how long a wood privacy fence will last. When the price of the post, the concrete and the gravel are added together the VersaPost often does not cost much more than a wood post. Digging smaller, shallower holes is easier and there is less of a chance of hitting rocks or other obstructions. There is also less dirt to be disposed of when the job is done. In most cases you will find the VersaPost to be your best investment. "I like good engineering and form that follows function. Your post has that in spades. I think you have a great product. It's precisely what I want, and probably what 90% of the average-joes like me are looking for in a post (very reasonable price, best available 'durability: environmental impact profile' that I've seen, straightforward install, very good customer service)." The height of post required will depend on the height and style of the fence. The VersaPost comes in 3 different lengths: 5' 6" for four foot fences, 6' 6" for five foot fences, 7' 6" and 8' for 6 foot fences. To get a quote simply let us know how many posts you will need and the city and zip code it will ship to. We will then send you an email with prices and shipping options. If you decide to place an order just reply to the email. For security reasons we route all sales through Paypal. (You do not need a PayPal account to complete the order.) We will send a "request for payment" to your email address. You can then pay with a credit card or use your PayPal account if you have one. When payment is received the order will be processed. When the order ships we will send you a tracking number so that you can track your order. It's that simple. If you do not receive a prompt response to all emails please check your spam folder. Thank you. Note that we do not make you fill out your email address twice for verification as some forms do. Please enter your email address carefully and double-check that it is correct before hitting the send button. This is where the purchase form used to be. But as of 2018 the VersaPost is no longer for sale. Although the post has received many positive reviews it is no longer financially doable. I was proud to have a high quality post that was reasonably priced and made in the U.S.A. But like many others before me I have lost out to cheap Chinese products. So why is this page still here? Just in case anybody is interested in continuing this project. I found marketing to be much more difficult than inventing. Maybe someone else can do a better job. If you are interested then please drop me a line. And thank you to all those who took the time, without me asking, to say positive things about the VersPost.